I share my somewhat messy office with my alien kitten, Wookie. That’s my favorite place to work because I can go in there, turn on the radio/cd player/tv and close the door! LOL Well that was true until the end of June 2013. Wookie is fluffy, too fluffy if you know what I mean. So instead of giving her any of the treats sitting on the desk, I simply replied ‘I’m writing a guest post for a very popular blog’. At this point, Wookie leaped onto the back of my chair because her minion, Skye, had entered the room and Wookie always likes to look down at her. I think it has to do with a cat’s natural sense of superiority. Skye, meanwhile, is rooting her nose under my hand demanding, in her own sweet way, her share of pets. 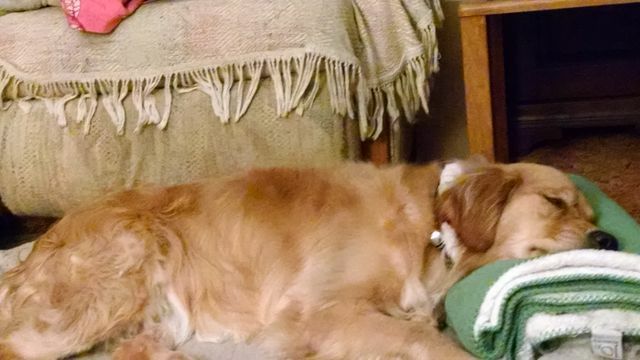 In case you haven’t heard, Skye is my Golden Retriever who came to live with us last year. She started as an 11 pound bundle of golden fluff that the vet’s office promptly named ‘Cutest Puppy of the Year’. She’s still adorable. She’s still golden. And she’s got more enthusiasm in her than Wookie and I can wrangle in any given day. Okay, so how does an energetic and enthusiastic young dog fit in with a writer and an alien kitten? It’s like life everywhere. You have to learn to balance. In this case, I had to learn to balance my time and energy. Wookie is great for solving writing problems. With a wise and thoughtful ‘Mmrrppp mee-rall’, she can point out mistakes I’ve made in characterization better than an editor (and I’ve had some fine editors). But Wookie is a slow motion creature. The only thing she does fast is fall asleep. That’s where the Golden Minion comes in. With her boundless energy, Skye gets both Wookie and I revved up and moving. And that helps me figure out the action part of my book plot. It also keeps me moving because Skye has needs of her own. She likes to retrieve (surprise!) so I have to spend time tossing a ball or a Frisbee or a cuddly toy. She likes running so I take her outside to do the Frisbee or just let her stretch her legs (and mine). When we come back inside, I’m energized and ready to write. Wookie has had her alien kitten-nap, twentieth of the day, usually in a sunbeam. On her back. With her feet in the air. If she feels like it, she’ll get up and join me by the computer while Skye wanders off to her bed to take her own ‘cat-nap’. Doggy-nap? Minion-nap? Whatever. It leaves Wookie and me the freedom to do the important work of writing that next fascinating scene. 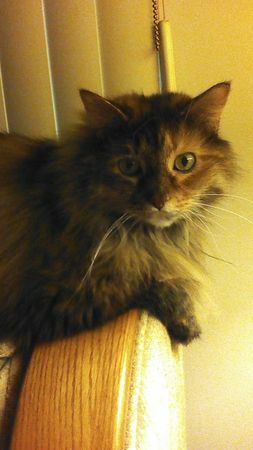 Wookie likes to hang on the back of my chair where she can read over my shoulder. If she’s quiet, I can bet she’s either a) impressed with the story or b) asleep. If you’ve ever met a cat, especially an alien kitten, you know that to impress them is quite a feat. With a flick of her pointy ears and a feline smile, she’ll ask, “Mwawww?” Which means are you done? Because it’s time for her nummies followed by a rousing game of kill the feather tease toy. A writer’s work is never done. Eric d’Ebrur is out of time. He must fine the legendary Heartstone and fulfill the ancient Gar’Ja bond he shares with the Stonebearer. But when he finds her, he discovers that love can be more dangerous than the Gawan threat. Eric can defeat the mind-controlling Gawan but will it cost him the woman he loves? After terrifying episodes of hypersensitivity, Keriam Norton thinks she’s losing her mind. 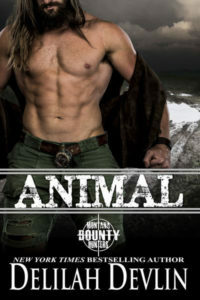 When handsome shapeshifter Eric d’Ebrur saves her from the monstrous Gawan, she’s sure of it. But insane or not, she’ll find the Heartstone and, if she’s lucky, a love to last a lifetime. Stranded on an alternate Earth, architect and Jill-of-all-trades, Liane Gautier-MacGregor must find her way back to her homeworld before she’s enslaved…or falls in love with a man who is the exact duplicate of her ex-husband. 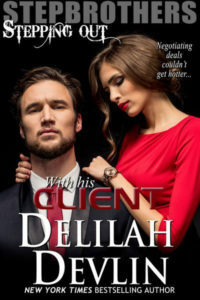 Devyn MacGregor’s alter ego as the Reiver Lord is the only way he can fight the Qui’arel and their nefarious Bride Bounty, a tax paid with human females…until he meets the oddly familiar woman who claims he is her husband. And who sets in motion the rebellion that will either free his countrymen or destroy them. This entry was posted on Friday, December 19th, 2014 at 8:25 am in General. Tagged: Guest Blogger. You can feed this entry. Both comments and pings are currently closed. You have excellent writing muses, Lynda. Wookie and Skye sound like wonderful companions. Beautiful. And this book Altered Destiny – interesting premise. I will have to find a minute and read it. Thank you for sharing. Hi Pansy Petal Thanks! Altered Destiny is one of my favorite books and has my favorite hero, Devyn MacGregor. I’m sure you’ll enjoy it. That was very entertaining tale of Skye and Wookie. the books look very interesting because I love books that have people who are different whether they be shifters or aliens ect. I did wonder one thing as this is Delilahs blog which I love and read daily, are all of your books YA or do some of them have a more adult theme?